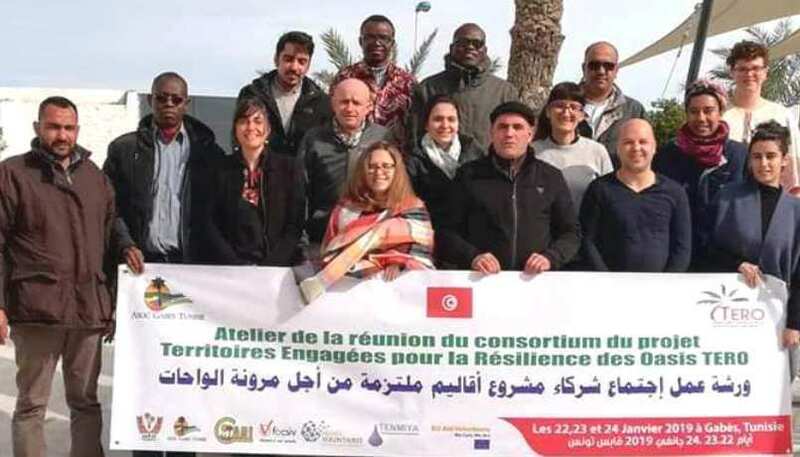 After less than 6 months after the previous meeting in Errachidia, Morocco, the members of the project “Territoires Engagés pour la Résilience des Oasis” – TERO met in the oases of Chenini, Gabès. Representatives of Tenmiya (Mauritania), of the Association Oasis Ferkla pour l’Environnement et le Patrimoine (Morocco), France Volontaire and CARI (France), FOCSIV (Italy) and the trainers of NEXES (Spain) met their Tunisian partner (Association de l’Oasis de Chenini Gabès) to discuss the progress of the project and its future orientations. During the three days of consortium meeting, participants visited the sites of intervention of the Association de l’Oasis de Chenini Gabès and met the volunteers involved in the activities. The meeting allowed association to have an initial assessment of the past year activity at various levels: technical, financial and administrative, as well as to reflect together on future steps. These days allowed also the representatives of the different countries involved in the project to share their experiences and to compare different points of view and ideas. Finally it was an opportunity to work side by side to furtherly improvements of the project. It was Nada BEN AHMED, coordinator of the TERO project in Tunisia, who told us about this meeting “It was a great opportunity to exchange information on administrative and financial procedures and to discuss important issues such as advocacy issues. Finally, our colleagues were able to visit our beautiful oasis of Chenini. I am very satisfied with this meeting result, especially for the presence of the media (Radio Elyssa FM) that gave great highlight to the event at the local level.